Snow days are interesting sociological events. There was a time when I found them relaxing and restorative. As a teen, I caught up on my homework and phone calls since it was before the days of cellular and you knew all of your friends were at home. As an adult, I felt snow signaled a break from the daily grind. It was time to put a stew on the stove, bake a pie, read a book or (if I was really ambitious) clean out a closet. 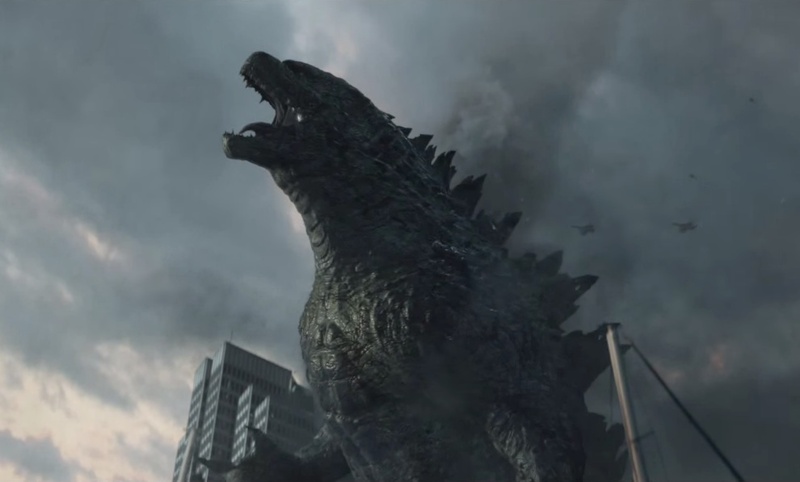 What better time to tackle a line on my New Year’s resolution list… In a perfect world! My only guess is to make the unofficial snow day bread and milk sandwich? I really don’t get it because no one ever mentions getting peanut butter for the bread. (Most likely because some viewers would be allergic to that.) Too bad because deli meat or cheese to put on the bread would be a bad idea in a power failure. 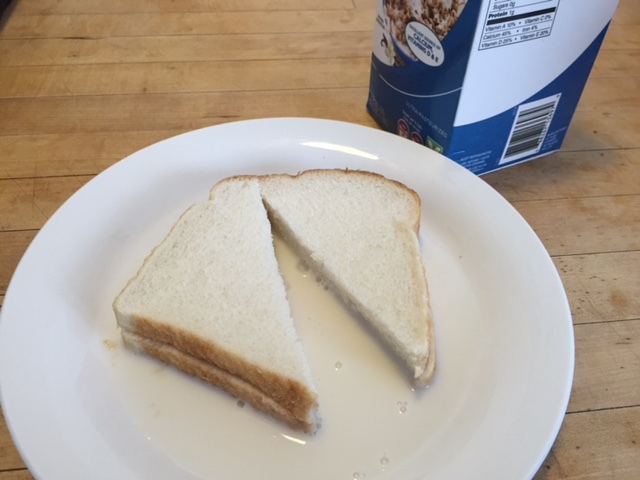 The peanut butter wouldn’t spoil… but then there’s that milk in the refrigerator. It goes bad faster than just about anything else! Seriously I’d rather not stock up on things I would otherwise never eat on an ordinary day. Without a stand by generator, I’ve also given up on visions of cooking comfort food from scratch while binge watching HBO series in the background. I’ve learned that a full fridge and freezer on the eve of a storm works like Murphy’s Law in my house. It will jinx the power into going out! Having spent my college years on Long Island, I remember a storm that paralyzed the Long Island Expressway for days. People were pulled from their cars and brought to local fire departments. My dad had to spend the weekend in the Syosset fire house because there was no way to get home. 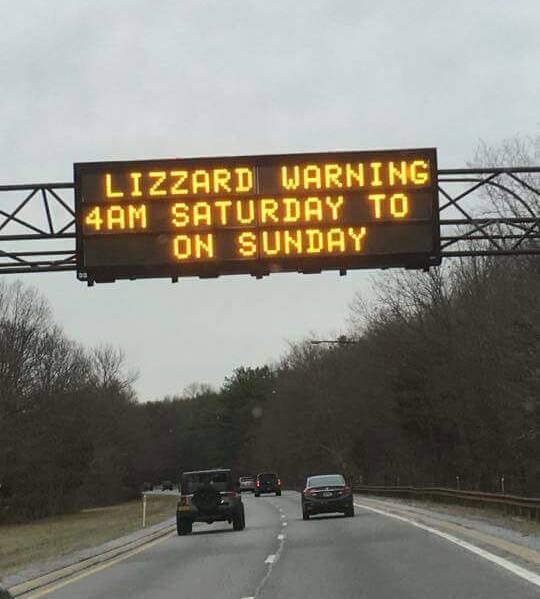 I saw this photo on Facebook of a traffic sign on The Northern State and just had to say: Godzilla is the best name for the next monster storm! The mania I saw on Friday afternoon in the Fairfield Connecticut Whole Foods was like a grade b movie. The truth is, no matter how much you try to prepare for a giant blizzard or lizard strike you are going to be without something you need and will have wasted time and money buying things you don’t. I have my flashlights, batteries, blankets, and enough previously forgotten food in the freezer to survive until the snow plow comes down the road and reunites me with the outside world. 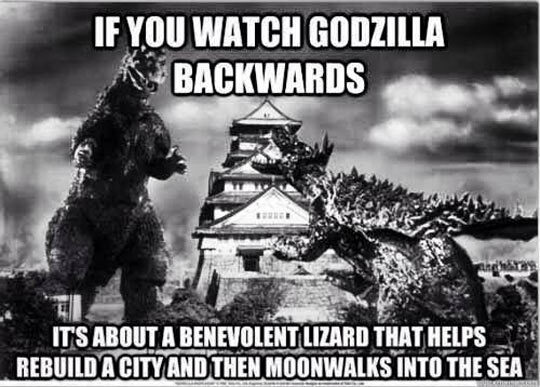 As for Godzilla, we used to play his movies at junior high school Halloween parties and found you can make the world right again by running the film backwards! Certain Holiday rituals are simply timeless, like “Auld Lang Syne” playing when the ball drops in Times Square on New Years Eve. 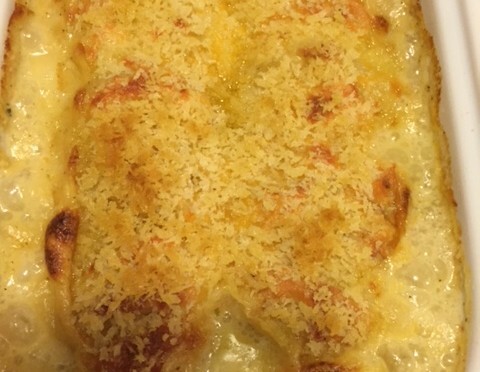 In our house, some kind of au gratin or escalloped potatoes are as much a New Year’s tradition as that old Scottish tune imortalized by Guy Lombardo. 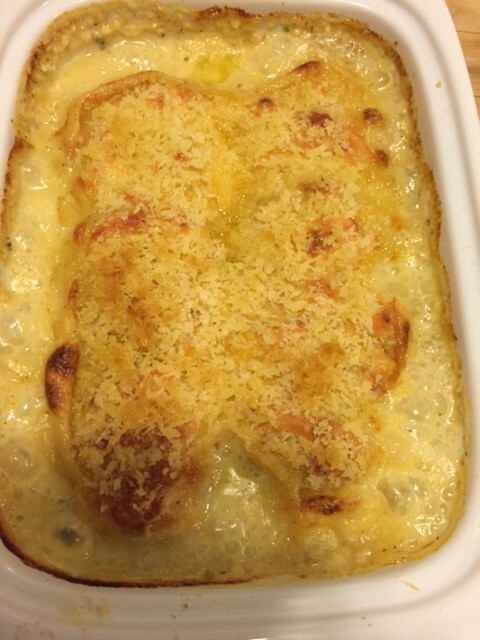 The dish is really very versatile as you can mix and mach the cheeses and toppings. 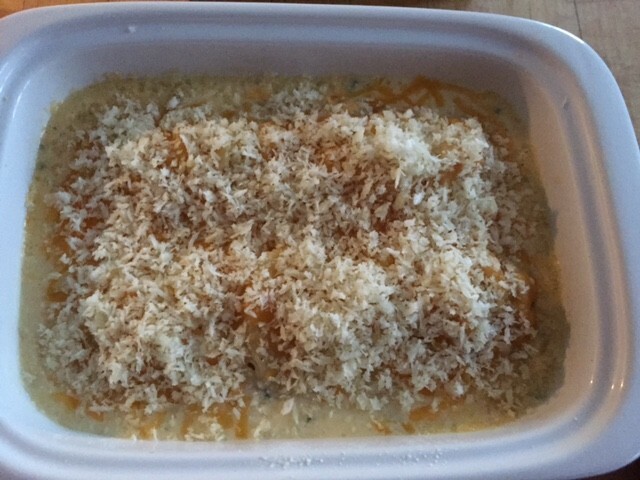 The magic is in the “mornay” or cheese sauce you create by melting your favorite into a basic bechamel. One year I might use a sharp Wisconsin cheddar and the next a blend of Swiss and Gruyere. Even the topping is open for interpretation. The family heirloom recipe was made with dry buttered bread crumbs but we’ve also tried using crushed potato chips or pretzels in the past. The outcome is always different but you rarely can go wrong. The version I’m sharing today is what we just served for our New Year’s dinner. I made it with Vermont cheddar and chives and topped it off with panko bread crumbs. 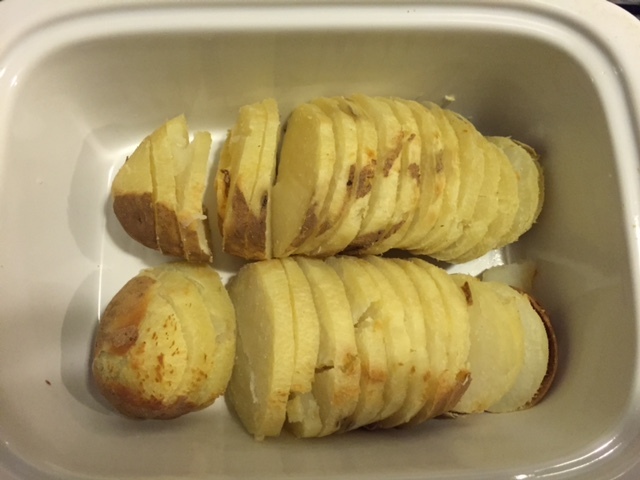 Unlike many recipes, this one begins with baked russets not raw sliced potatoes. It can be made a couple days in advance. Afterall, there are more festive places to be on New Year’s Eve than stirring sauce on top of the stove. 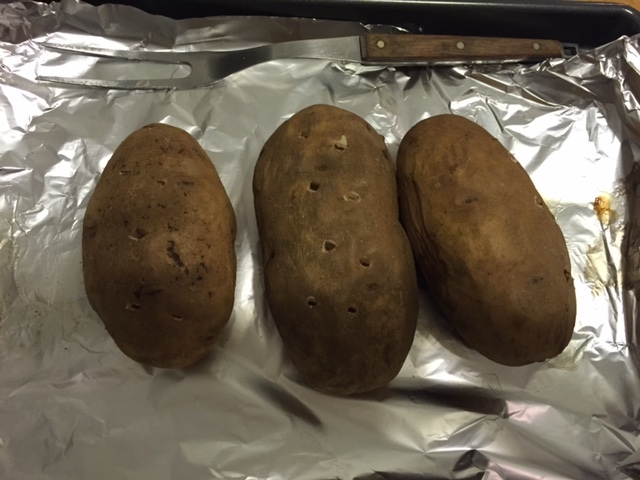 Preaheat oven to 400° and place potatoes on a baking sheet. Bake for 1 hour and remove from oven. Pierce with a fork to let out steam and allow to cool to room temp. Meanwhile, make the sauce by melting butter in a medium saucepan and sauteing garlic. 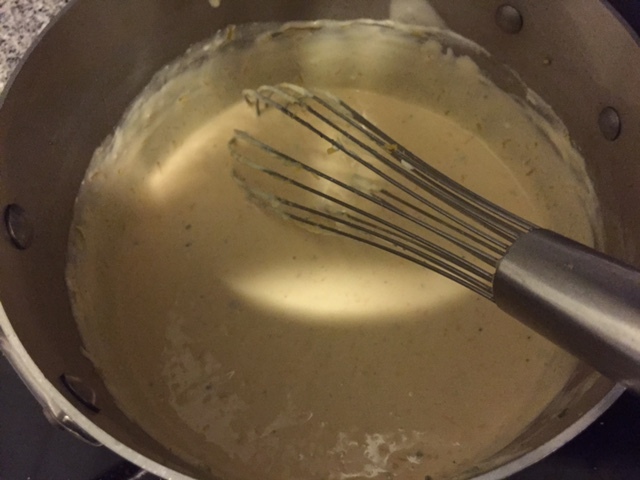 Blend in flour with a wire whisk then slowly blend in milk, stirring until thickened and smooth. Blend in 1 cup of cheese until melted and stir in chives. Carefully pull the skin off of potatoes that have puffed away and become loose but leave the skin that still clinging to the potato. Slice in thin slices and arange standing on side in a 1 1/2 qt buttered casserole dish. 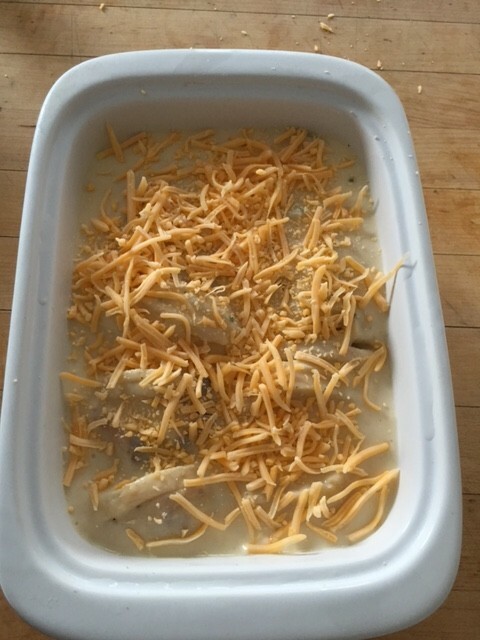 Cover potatoes with sauce and sprinkle with remaining 1/ cup of cheddar cheese. 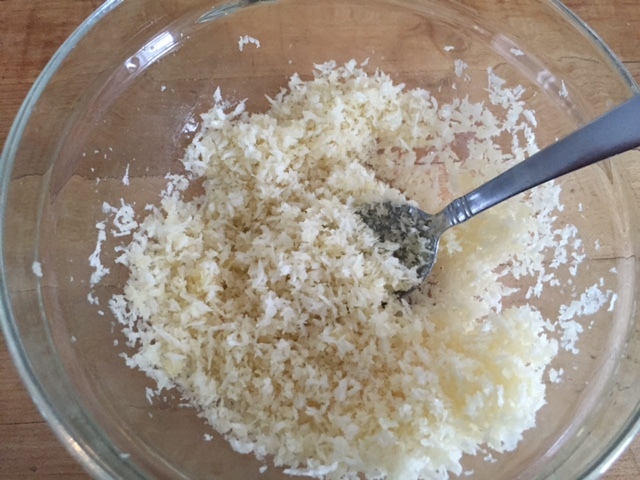 Combine Parmesan with panko bread crumbs.